Stokes Croft Streetfest 2011 was a resounding success which attracted over 8000 people for a day of positive fun-filled celebration. Members of the community, music lovers and families alike enjoyed the festivities and friendly atmosphere which continued into the night without incident. It was fantastic to see the recent troubles in the area put aside and everyone coming together to support local trade and talent and join in the celebrations. There were over 160 performances of live music, street theatre, DJs and cabaret from local artists which were highly successful, as well as over 35 participants in the hugely popular Crofts Dog show which saw stunning thoroughbreds alongside unique pooches full of character. Rosettes were worn with pride as their owners enjoyed the street games, craft stalls and food markets. It was great to see local businesses getting the level of traffic they deserve as everyone enjoyed the event and packed out every venue on the street. New customers discovered the delights of the area’s attractive cafes, bars and restaurants, offering anything but off-the-shelf experiences. The festival was planned by members of the community from many different backgrounds with many different beliefs and ideals, and was a shining example of how collaboration and celebration can bring everyone together. A special thank you goes out to the police for their huge support as they helped ensure the festival’s success and donning flower garlands were welcomed by the public. Also the council and street cleaning team who provided recycling points and cleaned up after those that didn’t use them. Over 100 volunteers worked tirelessly for hours to make the event happen, without whom none of this would have been possible at all; you are all true super stars with massive hearts and there are many people with lots of love for you. And the final thank you goes out to all the artists, performers, workshop leaders, programmers and businesses that made donations; your contributions meant we could stage the event for free and keep it an inclusive, welcoming festival for all and so we hope you’ve gained new fans and wish you all the best for the future, as Stokes Croft returns to the vibrant place it is. Lakota will be closed and so we have moved the Lakota after party line up to Coroners Court next door, and added a Silent Headphone Party outdoors. The daytime event in the car park is unaffected and there will be signs and stewards for directions. Tesco’s on Cheltenham Road won’t be open/opening for the festival, its official. Before you all sigh about the lack of convenience there are plenty of other stores, cafes and restaurants throughout the area, as well as a number of delicious food stalls around Kings Square, Coroners Court and a World StrEat Café in the Bear Pit. There is still a street drinking ban that is in place across Stokes Croft so if you’d like a beverage please do so only within the licensed venues and Coroners Court outdoor area where there is a bar. Please drink responsibly and look after for yourselves and each other. There will be portaloos around Kings Square and Coroner’s Court as well as public toilets in the Bear Pit. You are also welcome to use facilities within any of the music venues participating which are all free to enter until 6pm. Please don’t be grotty and pee elsewhere as its not nice for residents. There are facilities –use them. We have also had to work hard to gain licenses and permissions for all the outdoor stage areas and really want the event to go well so that we can do it again next year. So unfortunately we cannot add any unauthorized areas, stages or systems at this late stage, as doing so could jeopardize the event’s future. Please don’t spoil it for everyone by staging your own after-parties… please come and enjoy what’s already been planned. If you fancy throwing a party for next year let us know and we’ll get you involved in our plans but it’s too late for this year. If you are a local resident with concerns please get in touch with us directly so that we can take action. We’ll be keeping noise to a minimum and finishing at 6pm/9pm but call us if you feel it’s disturbing you. There will also be a number of friendly informed stewards and security throughout the area. We have to clean up ourselves and we’re not being paid, so please help us out by not dropping litter. Let’s keep our streets clean and leave no trace. If you see volunteers picking litter up feel free to help and feel the love. We’re on a shoe-string with the daytime event costing £14,500 to put on. To keep the day free this money is raised through after party and raffle ticket sales plus donations so please chuck your change in the buckets and help keep it free. Huge thank you to all everyone who has helped make this possible including volunteers, businesses, people who have lent equipment, and performers who are playing for free as well as helping promote it. You’re wonderful each and every one of you. Massive thumbs up to the council and police who have greatly supported us in helping make this amazing event happen. Streetfest is about celebrating and showcasing what a wonderful place this really is, so leave any negativity at home and bring smiles and sunshine. Let’s look out for each other and have a wonderful day! Many thanks and we are so excited about seeing each and every one of your beautiful faces. P.S. Don’t forget your fancy dress. If you would like to have a stall at the event (non food/drink e.g. clothing, arts and crafts, jumble) please download the form: Stokes Croft Streetfest traders pitch booking form, and come along to Kings Square before 11am on Saturday. We have pitches available in the Bear Pit, Kings Square and the Coroners Court area from just £20! It’s too late for food and drink stalls for this year, sorry. To keep the daytime activities of Stokes Croft Streetfest free, we are not only raising cash by selling tickets to the evening after-parties and collecting donations, but we also have an amazing raffle!! Raffle tickets will be available all day at the festival for just £1 and winners will be notified within 5 days. 2x £5 Pieminster vouchers plus a new Summer of pie t-shirt with some of their new posters and postcards. SHOP DUTTY – A Bristol vintage fashion and customized clothing boutique. LSS PRESENTS… HOT WUK MEETS OFFMENUT RECORDS: End of Term Rinse Out! Massive thank you to all the kind and generous people that have donated prizes so far. It’s official! Stokes Croft Streetfest 2011 is shaping up to best amazing! Come along from midday on Saturday 21st May to enjoy all the daytime activities for free, enter your dog into the Crofts Dog Show in Kings Square at 1:30pm, then from 6pm one wristband gets you into every club and live music venue on Stokes Croft for just £8 (in advance) for a mega after-party! There’s no better time to come along and sample the many delights this area has to offer from the staggering array of cafes and restaurants (Vegan to food fired pizzas, Jamaican to local and seasonal), fantastic art galleries and artists studios, boutique shops, museum, and obviously great pubs and live music venues. 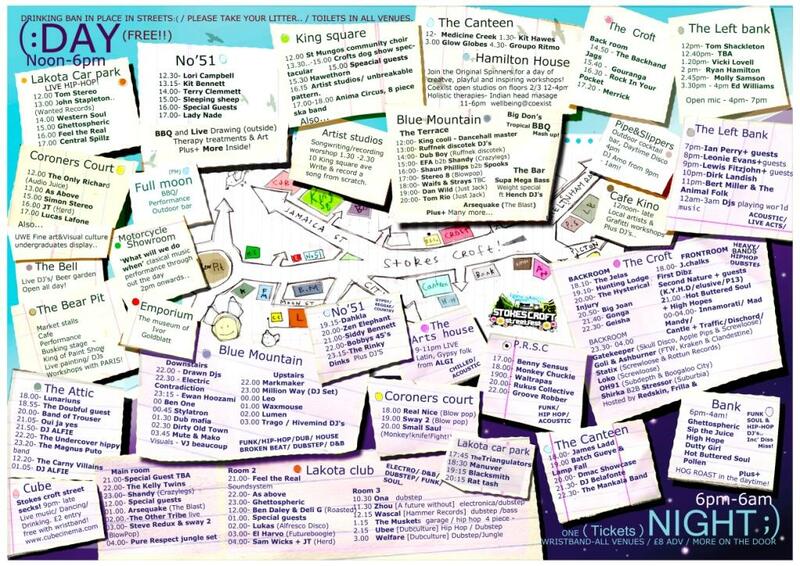 <– We’ve linked just a few! Have you ever dreamed about a joyful place with peace, prosperity and kindness for all mankind – a place in which we respect each other despite the differences in our culture, religion and way of life? Welcome to the beautiful cornerstone of Bristol known as Stokes Croft. Stokes Croft ended up grabbing headlines over the weekend, following the opening of Tesco’s. Emotions ran high for some people, as a result of the difference between our ideals. This led to grief and sorrow being inflicted on many innocent victims, by a few who abused the power of their convictions. Let’s remember last year’s Streetfest, a beautiful celebration where, let’s face it, love and happiness pretty much emanated from everywhere. Help us, the Stokescroft Streetfest team recreate this. Let’s all actively choose peace and harmony on this day. Let’s remember why we feel so passionately about the area and celebrate its beauty, diversity, creativity and tolerance, it’s a warm welcome to all. Stokes Croft Streetfest is a day-long festival celebrating the cultural fertility of Stokes Croft as truly unique; a place of outstanding un-natural beauty, an urban garden blossoming with ideas, creativity and passion. It’s about fun, positivity and revelry. It’s about having a damn good time. People from all backgrounds, of all ages coming together for the shared enjoyment of music, dance and food. It’s about enjoying the safe, welcoming atmosphere, the smiles, the bright colours, the range of entertainment on offer. It’s about meeting people, making friends and getting involved. Last year’s festival was a joyous affair as Stokes Croft hosts a fantastically diverse range of organisations, businesses and creative people that live, work and play here. It’s a living tapestry and the perfect backdrop to a festival organised by the community to show what people can achieve when they work together towards sustainable and positive regeneration. The Streetfest welcomes all the residents as well as visitors to the area and is designed to support local businesses, artists and community cohesion. Photos of last year’s event HERE. What makes Stokes Croft so magnificent is that it’s people-powered, with individuals and organisations all working in completely different ways to improve their environment as best they can one step at a time, ensuring the seeds of grass roots regeneration are able to take root and flourish. Its organic, evolving into the shape best fit for survival, for sustainability, rather than being engineered into a bleak quick fix dystopian image of somewhere else’s future. And this is important. Everyone can coexist here. Problems are not moved on, rather they are faced with the acknowledgement that we all as human beings have very different needs, desires and expectations of the city we call home. One size does not fit all, instead a wardrobe must contain many things for many people, and to be that it must be rich, diverse and full of variation. And it is this that we aim to celebrate and promote. 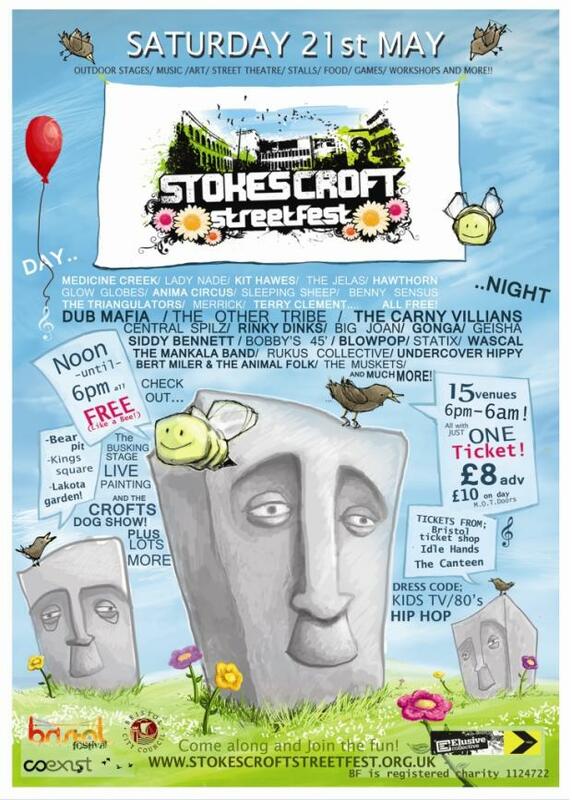 Within walking distance from just about anywhere in Bristol, Stokes Croft StreetFest is here for everyone. Bring your nan. Or your dog. Just make sure to arrive at midday, and if you’ve got the stamina, don’t go home til six am. There’s no need for a packed lunch because there will be veritable mountains of delicious nosh, but do bring your suncream and a smile. At this hour of greatest unrest and turmoil in Stokes Croft, the greatest force to be reckoned with lies within our hearts — a force of love and tolerance for all. We can resolve the greatest of our differences if we dare to have a constructive conversation with our enemy, whoever you might perceive that to be. We the people of Stokes Croft can lead the way, if each of us so choose, so please choose LOVE and come along and get involved……..